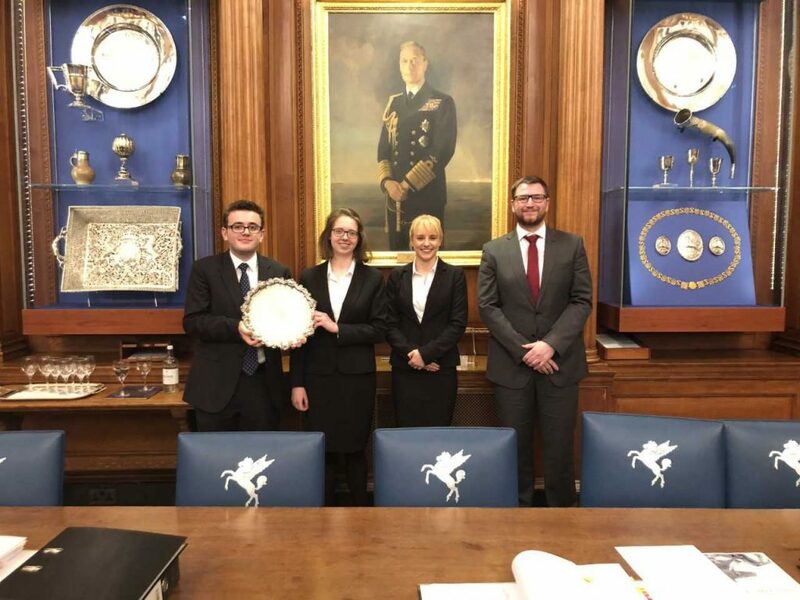 On 22 October 2018, we represented City Law School in the Inner Temple Magna Carta Moot. This is an annual exhibition moot in which the winners of the Inner Temple Inter-Varsity Moot appear against the winners of the English Speaking Union-Essex Court Chambers National Mooting Competition. Eno and Henrietta (left), with the University of Salford’s Emma and Adam (right). Finalists of the Magna Carta Moot. The moot was set in the Supreme Court and concerned a judicial review challenge brought against the Office of the Prime Minister. The public had voted by a narrow majority to reintroduce capital punishment for the most serious crimes, and as a result the House of Commons passed the Capital Punishment Reintroduction Bill. However, the House of Lords made a wrecking amendment when they passed the Bill, which effectively neutered it. Consequently, the Prime Minister submitted to the Queen a list of people to be appointed to the House of Lords as life peers, so that there would be enough members of the Lords in favour of the Bill to guarantee that it would be passed without any wrecking amendment. In doing so, the Prime Minister bypassed a method of enacting legislation without the assent of the House of Lords, contained in the Parliament Acts of 1911 and 1949. Acting for the appellant, we had to argue that the Prime Minister’s decision to advise the Queen was both ultra vires and for an improper purpose. Because the moot involved a cross-appeal, in which our opponents argued that the matter was non-justiciable, we then had to submit that it could in fact be reviewed by the courts, despite its political nature. It was a privilege to moot in the Inner Temple hall in front of 100 BPTC students, and to be judged by five Benchers: Lord Hughes, Mrs Justice Lambert, Mrs Justice O’Farrell, HHJ Deborah Taylor and Christopher Brougham QC. We were delighted to be declared the winners of the moot at the end of the evening, and would like to thank not only our opponents, Emma Clarke and Adam White from the University of Salford, but also Sellisha Lockyer of the Inner Temple for organising the moot, and Jonathan Schaffer-Goddard of 4 Pump Court for writing the moot problem. Many congratulations to Henrietta Boyle and Eno Elezi for surpassing their excellent win in the Inner Temple Inter-Varsity Moot, and going on to win the Magna Carta Moot too! No mean feat when in front of so many spectators and a five-strong bench. Thanks to both for putting this piece together about their big day.